So you’ve decided (or been given permission!) to get your very own small ‘furry’, or perhaps even a whole bunch of them. Your pet will be spending a lot of time in their new home so there are some important things to consider when searching the huge array of cages and tanks available. How would your pet’s ancestors and wild counterparts behave in their natural habitats? What sort of environment would they live in? Maybe you can’t recreate the Syrian desert in your living room but if you can give your pet the next best thing to ‘the wild’ he will be able to behave in a more natural way and be much less likely to suffer from boredom. Wild hamsters range over wide areas looking for food but need a place to escape to if they come across a predator – make sure your hammie has lots of room to explore and play but also some snug nests and hiding places where he won’t be disturbed. Hamster Heaven 80 Cage is bright and colourful with tunnels and multiple layers so your pet can go on a real adventure before returning to his cosy house for a nap. If you have your heart set on gerbils then you will need a home big enough for at least two of them because gerbils are very social. Like hamsters, gerbils spend lots of time foraging for food but also have a network of tunnels and chambers to escape to and sleep in. 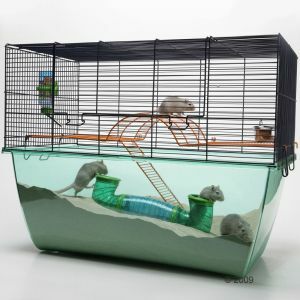 Small Pet Cage Habitat XL is a gerbilarium which means it has an extra deep plastic base perfect for burrowing material such as sand or shavings. You can also hide food in the sand and watch your pets snuffle it out as they would in the wild. Wild rats live in large social groups so it’s very important that you have at least two. A ‘rat house’ will need to be big enough for full grown rats (the male ‘bucks’ in particular do get quite large!) Rats will go pretty much anywhere to find food and are very athletic so they’ll need fun ways to exercise in the cage. Something like the Furet Tower will give your rats plenty of space both vertically and horizontally with multiple levels. It also comes on wheels which is handy if your rats fancy a change of scenery! Buying a large cage means you’ll have plenty of space for toys. Rats are particularly fond of climbing ropes and hammocks. Think carefully about where to put your pet’s home – it should be in a quiet spot (not right by the TV!) where the temperature is pretty constant and away from chilly draughts. Make sure your pet’s new pad is set up and ready with bedding, food and water before you bring him home as this will help minimise the stress of settling in. Have fun with your new pets! Don’t forget, we’d love to see pictures of them on our zooplus UK facebook page. This entry was posted in Small Pets by emmas. Bookmark the permalink. Recently I got the sweetest rats in the whole world. I am very excited about them. We bought for them the Essegi Small Pet Cage Baffy which seems to be huge now that they are only babies, but I think it is going to be a great home for them soon! It is big, very homey with all the accessories in it and we can move it all around the place. I recommend it for 3-5 rats.